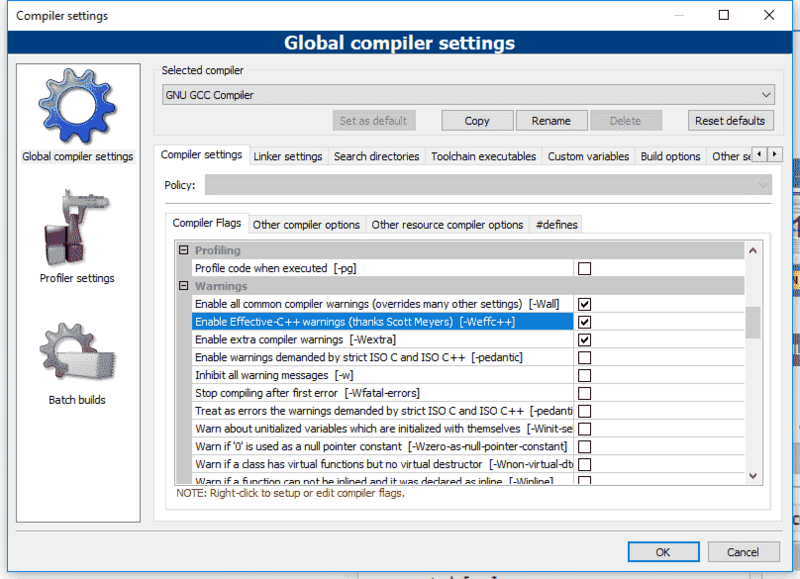 When you write your programs, the compiler will check to ensure you’ve followed the rules of the C++ language (assuming you’ve turned off compiler extensions, as per lesson 0.10 -- Configuring your compiler: Compiler extensions). If you have done something that definitively violates the rules of the language, during compilation the compiler will emit an error, providing both line number containing the error, and some text about what was expected vs what was found. The actual error may be on that line, or on a preceding line. Once you’ve identified and fixed the erroneous line(s) of code, you can try compiling again. In other cases, the compiler may find code that seems like it might be in error, but the compiler can’t be sure (remember the motto: “trust the programmer”). In such cases, the compiler may opt to issue a warning. Warnings do not halt compilation, but are notices to the programmer that something seems amiss. Don’t let warnings pile up. Resolve them as you encounter them (as if they were errors). 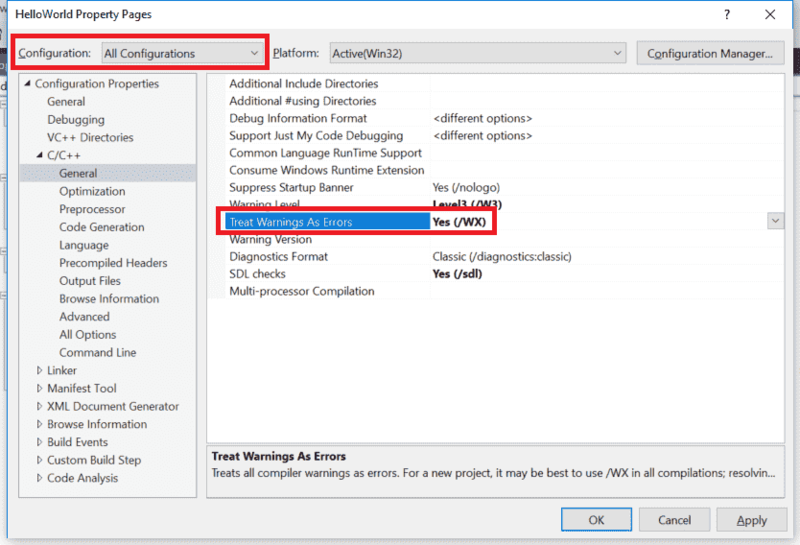 In most cases, warnings can be resolved either by fixing the error the warning is pointing out, or by rewriting the line of code generating the warning in such a way that the warning is no longer generated. In rare cases, it may be necessary to explicitly tell the compiler to not generate a particular warning for the line of code in question. 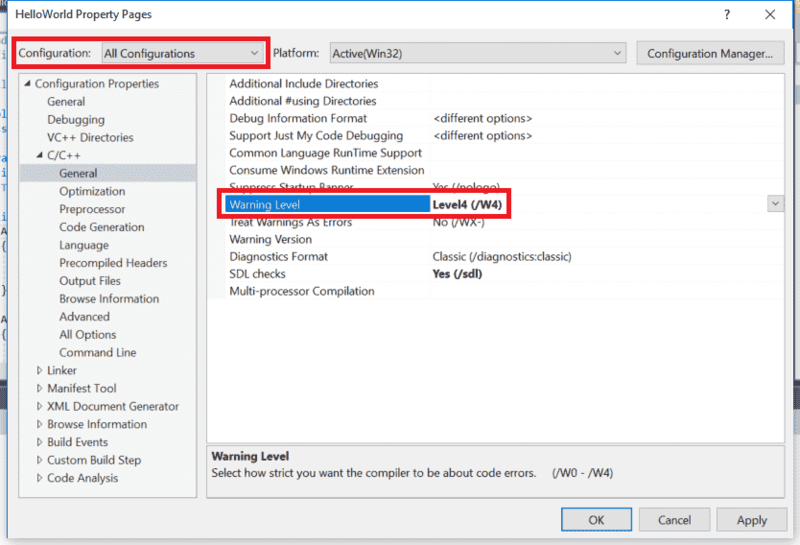 C++ does not support an official way to do this, but many individual compilers (including Visual Studio and GCC) offer solutions (via non-portable #pragma directives) to temporarily disable warnings. By default, most compilers will only generate warnings about the most obvious issues. However, you can request your compiler be more assertive about providing warnings for things it finds strange. Turn your warning levels up to the maximum, especially while you are learning. It will help you identify possible issues. 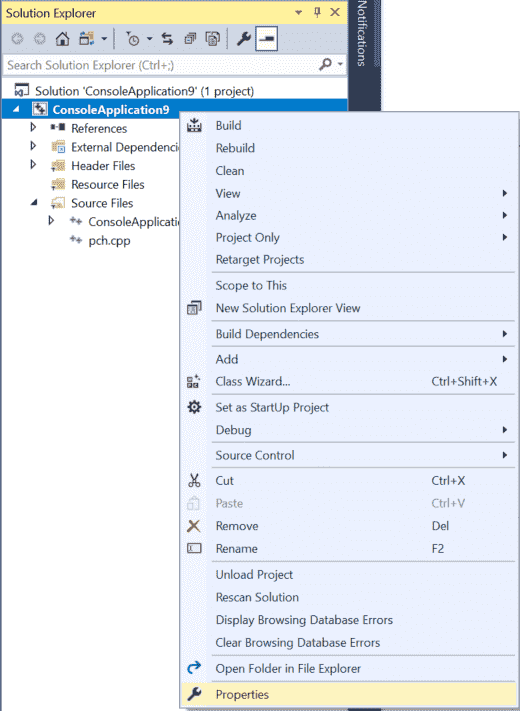 From the Project dialog, first make sure the Configuration field is set to All Configurations. Note: Do not choose EnableAllWarnings (/Wall) or you will be buried in warnings generated by the C++ standard library. Note: The -Werror parameter is explained below. It is also possible to tell your compiler to treat all warnings as if they were errors (in which case, the compiler will halt compilation if it finds any warnings). This is a good way to enforce the recommendation that you should fix all warnings (if you lack self-discipline, which most of us do). Then select C/C++ > General tab and set Treat Warnings As Errors to Yes (/WX).
. Am I doing this right? 1. What is the function of -fexecptions flags when I compile the project and can I omit that ? 2. 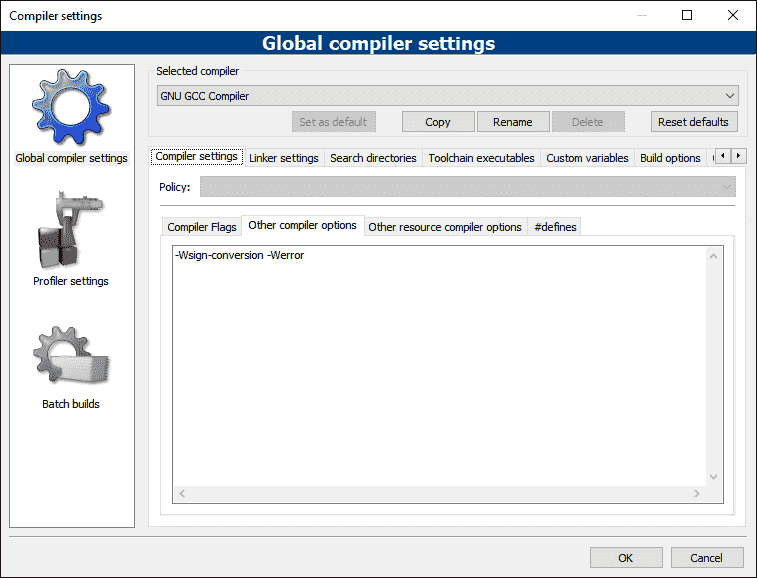 For debug version of the project, is it necessary to use -g flag? 1. It enables exception handling. It's enabled by default for projects written in C++, you can ignore it. 2. If you want to debug your program, yes. -g adds debugging information (eg. function names) to the executable. Without those, it can be hard to figure out what's happening. I don't have any familiarity with Xcode. Perhaps another reader can answer. I'm having the same issue, none of the examples they've given in the past 4 sections has applied to Xcode, at least not that I can find. Really Thank you so much, this really helps me a lot to find out minor mistakes of mine . This increases a programmer perfection to make his program free against any bugs. g++: error: unrecognized command line option ‘-Wextra-Wsign-conversion’; did you mean ‘-Wno-sign-conversion’? and got no errors or warnings but am not clear on what that flag is. Can you help?
. Running Debian Buster (Testing) KDE and using Kate and Konsole if that makes any diff. PS: Made a minor edit and screwed up the formatting without changing it. Sorry. There should be a space between -Wextra and -Wsign-conversion. here it says: "The C runtime libraries and the C++ standard libraries are intended to emit no warnings only at warning level /W4." I appreciate the warning (ha ha). I've updated the article accordingly. Thank you much! Yep, the screenshot of codeblocks is also showing the wrong entry. Text and picture updated. Thanks for pointing out the error! Hello! I may have found a typo, and wanted to point it out in case it was a mistake. When you said "you can request your compiler be more assertive about providing warnings about for things it finds strange", I think you might have accidentally put 'about' a second time. No may about it, definitely a typo. Again, thanks for pointing all of these out. My pleasure! I'm glad I could help. I worded it in a subjective way to make sure I wasn't possibly just misinterpreting something and falsely pointing it out, especially since I'm not entirely familiar with the field yet. That's what I'm here to change, though!